Born in Faislabad in Pakistan, Krishen Khanna grew up in Lahore, only studying art after he graduated from college at evening classes held at the Mayo School of Art there. In 1947, Khanna's family moved to Shimla as a result of the Partition of India and Pakistan, and Khanna was deeply affected by not only the change in his personal life, but also the socio-political chaos that reigned around him. His early works are reproductions of the scenes that were indelibly imprinted in his memory during this period. Most of Khanna's work is figurative; he chose to not explore the abstraction that most of his contemporaries were delving into. In an interview with Saffronart he says "I used to do abstracts earlier and I have now moved on to human forms. I thought that the person or the individual is being neglected - the person in a particular situation who is influenced by the conditions around. I want to now emphasise the human beings caught up in their particular condition." Bordering on the narrative, Khanna's work captures moments in history, much like photographs do, but the artist's technique is far from photo-realist. Khanna transfers his observations onto the canvas with spontaneity and exuberance, keeping the representational elements of his subject matter intact. The artist's use of colour and his expressionist brushwork make the mundane rise to the challenge of the creative. A largely self-taught artist, Khanna studied at the Imperial Service College, Windsor, England, from where he graduated in 1940. After his family's move to India, a job with Grindlays Bank brought him to Bombay where he was invited to be a part of the now famous Progressive Artists' Group. 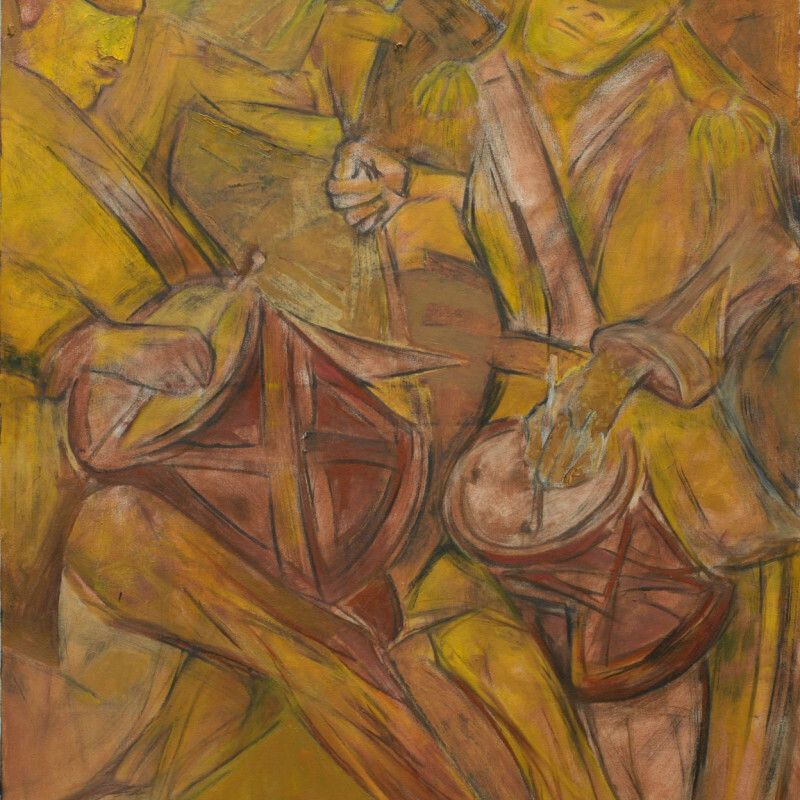 The first exhibition in which Khanna's works were featured was one of this Group's exhibitions held in 1949. In 1955, Khanna had his first solo show at the USIS, Chennai, and since then has been exhibiting his work widely in India and abroad. Among his recent solo exhibitions are 'The Savage Heart' at Cymroza Art Gallery, Mumbai, in 2008; Saffronart and Berkeley Square Gallery, London, in 2005; and 'An Airing' at Pundole Art Gallery, Mumbai, in 2004. Recognizing his immense contribution to Indian Art, the Government of India has bestowed several honours upon him including the Lalit Kala Ratna from the President of India in 2004 and the Padma Shri in 1990 and the Padma Bhushan in 2011. In 1964, Khanna was artist-in-residence at the American University, Washington D.C., and the next year, he won a fellowship from the Council for Economic and Cultural Affairs, New York following the travel grant they had awarded him in 1962.